Corvin Promenade is an integral part of the Corvin Quarter, Central and Eastern Europe’s largest urban renewal program, and provides an independent entertainment and shopping concept. 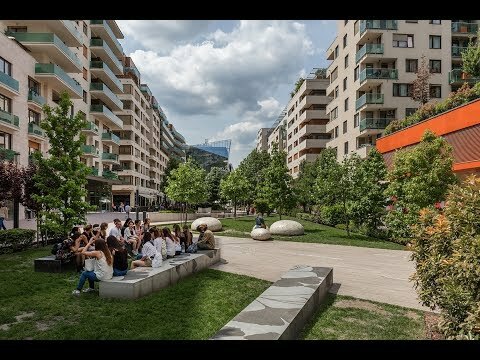 The development is part of Budapest’s newest, iconic public space, based on the designs of the world famous landscape architect Robert Townshend. The 36-metre wide and 350-metre long, plant-lined and pedestrianised Corvin Promenade has become the new centre of social life in Budapest thanks to its vibrant, lively restaurants and places of entertainment on the Corvin Quarter’s main street. There are residential properties, office buildings and alongside business units located on the ground floor level, as well as a wide range of restaurants, pubs, cafes and a theatre. The Corvin Promenade is an internationally recognised and award-winning location, the winner of the International Property Award Best Mixed Use Development Europe and the property development Award for Excellence from the Hungarian members of the FIABCI. In 2014, it was also the first development from Hungary to win first prize in the competition considered to be the Oscars for urban and property development, the Urban Land Institute Global Awards for Excellence. H-1082 Budapest, Corvin Promenade 1.